Extremely fast shipping, great product, this gun is unbelievable! This is an outstanding gun for USPSA Limited Division, IPSC Standard Division and Steel Challenge matches. It's one of the few guns you can buy for those purposes that actually needs no changes whatsoever. In spite of it's relative bargain price compared to other guns that it's competing against (primarily STI 2011's and custom built 2011 style guns) it's probably the most reliable choice out there and you lose nothing in terms of shootability, accuracy, ergonomics or trigger quality over those other guns. If you're familiar with the regular Tactical Sports and wondering if the the TSO is worth the $400+ upcharge, it absolutely is. CZ didn't simply slap on a different magwell, thumbrest and a set of orange grips and call it a day. 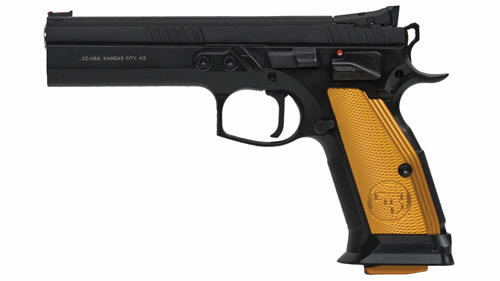 The overall fit and finish is superior, the grip diameter is smaller, the beavertail area is deeper, the undercut below the trigger guard is higher, the checkering on the front and backstraps is better, the rear sight is better and the trigger itself is aluminum instead of plastic and includes overtravel and pretravel adjustments. This gun has an out of the box 1.5# trigger pull. Once you have the pretravel and overtravel adjustmenst tuned in, the trigger only has about 1/8" of an inch of total travel with a very nice reset. The customer service was impeccable, and the gun is amazing.